Last week I took a class on making stocks and sauces. 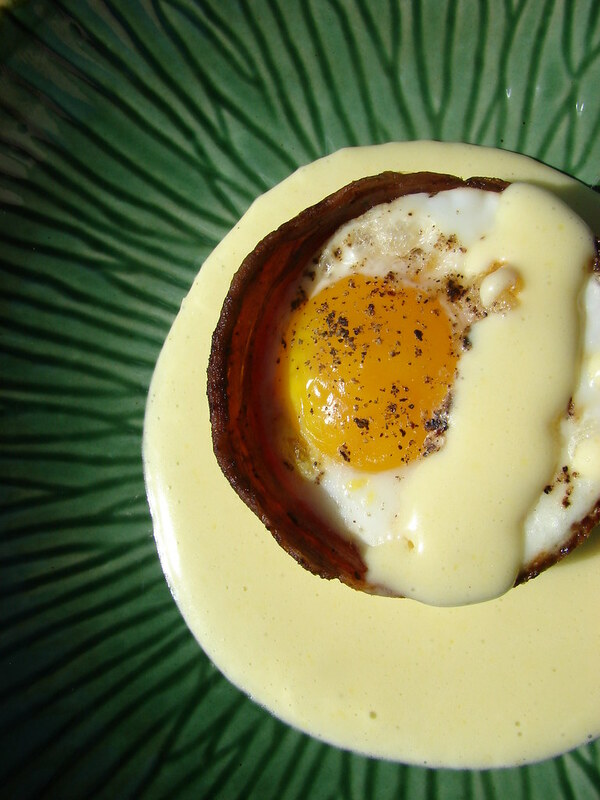 Since I needed an excuse to try my hand at Hollandaise, and Jack was inspired by not martha's bacon cups, we decided to make a decadent Sunday brunch incorporating both. Jack made the pancetta cups by placing two slices of pancetta around the bottom of the cups on a muffin pan, then placing another muffin pan on top to hold them in place. He flipped the contraption over so it sat like a normal muffin pan, then cooked them in a 350ºF oven for about 10 minutes. He then took them out of the oven, carefully removed the top pan, and put the one pan with the cups on it back in the oven, bottoms up, to crisp up...about 5 more minutes. Then, he took the cups off their molds, placed them into muffin pan cups, added one egg to each, and baked them for about 10 minutes, until the egg whites were opaque, but the yolk was still slightly runny. Fill a saucepan with 2" of water and bring to a boil. In a mixing bowl (stainless steel is best), stir together egg yolks and water and place over simmering water. Whisk continually until the become pale and ribbon-thick (The consistency of pancake batter). Remove from heat and slowly whisk in the melted butter. Add lemon juice and seasoning. The Hollandaise turned out well. It was easier than I thought. I get intimidated by sauces, especially these classic ones. But it turned out smooth, silky and delicious. That recipe, though, makes way too much for just 2 people. I knew i should have halfed it, but it was my first hollandaise, and I was afraid that I might be messing with some sort of classical sauce science mojo, so I just followed it as written. Making the hollandaise gave me such a warm fuzzy feeling, because I've just finished reading Julia Child's book My Life in France for the Kitchn's bookclub. The book is very inspiring, and I am looking forward to following Julia's lead and learn some more classic techniques. Stef, that just needs to be put into my mouth. Now. I saw Iron Chef America (Cora vs. Hillson) last night and one of the dishes was a masterpiece carbonara: fresh pasta topped with a crisp round of serrano ham holding a barely cooked egg yolk. i want this for breakfast every day of my life. i saw the bacon cups at not martha too, and the idea that i could eat all my food out of bacon pretty much made my head explode. Great job on the hollandaise Stef! I was intimidated the first time I made it too, but I took my time whisking in the butter and didn't let the mix get too hot so the results were excellent like yours! I make hollandaise sauce in a blender by slowly drizzling in hot melted butter. It always turns out great! My pal ED linked me to those bacon cups the other day. YUM. This brunch looks FANTASTIC. 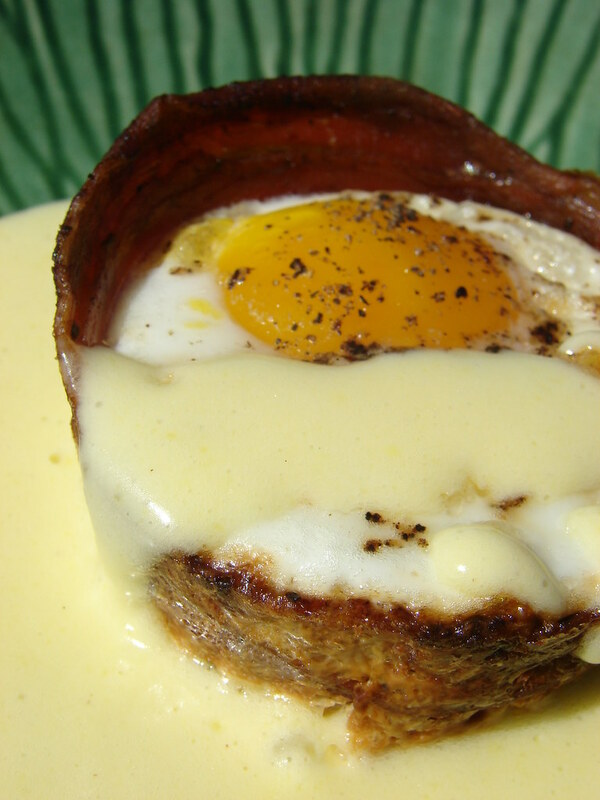 Can't really go wrong with any form of bacon and eggs. As always your food is droolworthy. What a great take on the bacon cup idea! I so love eggs benedict but I like mine on polenta sans the bacon. OR with smoked salmon and avocado. Or.. oh crap, now I'm hungry and pining for hollandaise and runny eggs. I'm with Kelly on the blender method. Always turns out for me that way! Sweeeet! Way to go Iron Stef. My mouth is watering just looking at your creation. 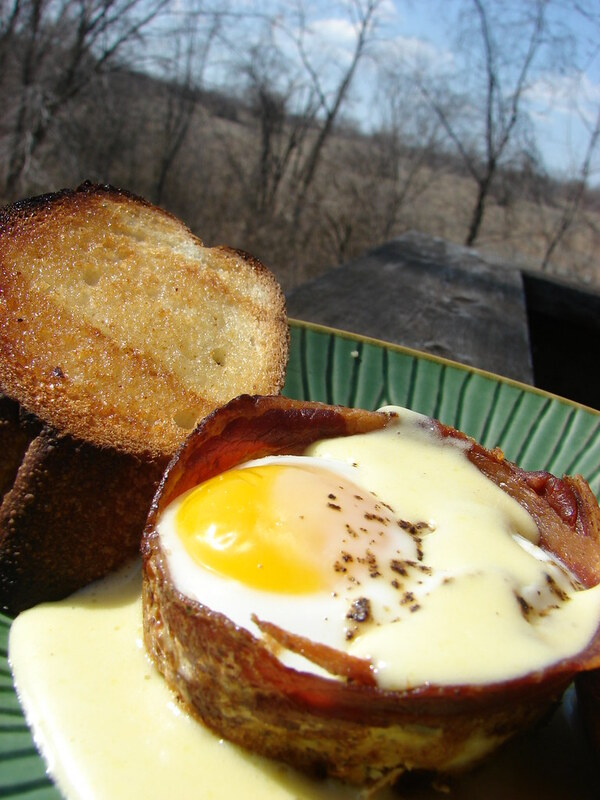 The cup really looks great and knowing the eggs are still runny...YUM! I can't wait to give it a try. You have mastered the true technique... with a whisk and bowl...congrats.